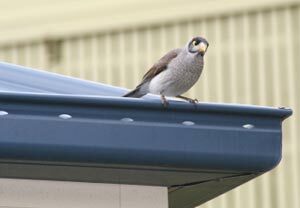 Do you have birds and pests in your roof? Leaf Shield gutter protection creates a secure barrier between your roof and gutter. The gap between the gutters edge and the roof is permanently sealed so that birds and pests can not enter your roof. Gutters are the most common entry point for birds and all types of pests to enter your roof. These pests can nest and create a noisy, messy and unhealthy environment. We have even installed gutter guard for pest proofing purposes to domestic homes, commercial and industrial premises, schools and churches.. Birds and possums are not only noisy but can spread lice and diseases. Leaf Shield will seal your gutters allowing only water to flow through, keeping birds and pests out. * Other vermin entering the roof cavity. Gutter guard your home from Pests and Birds with Leaf Shield Today! Call us now on 1300 36 22 46 for a free no obligation quote and receive a free gutter clean with every installation.